How do you satisfy the urge to grow your own clean, fresh food with only two square feet of balcony or a tiny or no outdoor space to work with? You’d be surprised to learn that even in such constrained circumstances you can grow enough to feed yourself, or at least meet your herb and salad needs. Firstly, most balconies, tiny terraces or backyards get only brief periods of sunshine, so a great way to capture more light is by using light walls or reflective surfaces, or even installing a mirror to reflect light towards your garden. Secondly, you will need soil and nutrients and you can easily get these by recycling what you already have (i.e. fruit and vegetable waste from your kitchen). We have a great article on home composting, where you can read all about how to get started. Organic is a must: why bother growing your own food to contaminate it with chemicals? Therefore, creating your own compost is the best way to maintain a closed-loop nutrient system that doesn’t need the input of chemical fertilizers, many of which are the by-products of animal cruelty and bad for the environment. In addition, introducing manures and animal based fertilizers also increases your own health risks: transfer of bacteria like E.Coli and others diseases and using chemicals will change and cause harm to the entire natural biodiversity of your garden. Now that you have your light and soil set, you need something to grow your vegetables in. Here’s where you need to think creatively: that means growing up, growing down, growing laterally and growing in containers. Growing up: Walls, windows, doors can become your garden. Wall brackets can allow you to put pots on the walls, while a trellis can allow you to grow climbing stocks up a wall. This also creates a great screen for privacy or decor. Growing down: You can create a hanging garden that utilizes the space outside the railings or indoors by growing in hanging baskets or window boxes. If you live in a cold area, you may even be at an advantage because you can use the indoor heat of your home to create a greenhouse effect by enclosing your balcony with glass windows and doors. Plastic soda bottles with the top sliced off create a great greenhouse for individual pots. Growing laterally: Challenging situations always bring out the most creativity and imagination! Aerogarden has developed a dirt free gardening system for small indoors projects, complete with light source (please be aware of the increased energy demand of such products). Herbkits has created a stackable planting system that utilizes a small space optimally. Some plants, like cacti, are very adaptable to growing in strange places like this wall garden. In addition, corporations and individual home owners have taken on the vertical garden concept and in fact brought us some very creative public garden art. Lush has an excellent vertical gardening guide for the novice and a low tech DIY guide from a shoe hanger is available at Instructables. 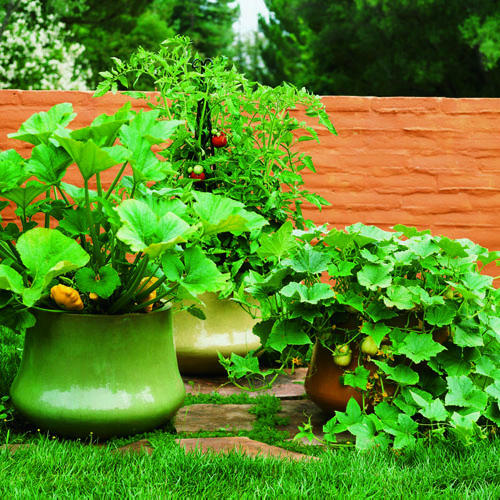 Growing in containers: Practically anything can be used for growing as long water, permeability and weight have been considered while choosing the planter. Plastic and terracotta pots are traditional, but you can make do with whatever is available; items like old boots, kitchenware, as well as discarded tins can be re-purposed, but don’t use anything you suspect has contained chemicals or that is painted inside. Vegetables can even be grown in the potting mix bags it comes in! Simply cut a small slit across the middle of the bag laying on it’s side, pop in some tomato seedlings and fertilizer and water. Upside down hanging earth boxes are growing in popularity as well, especially since tomatoes, cucumbers and other vines can benefit from the increased aeration. A simple hydroponic system can be rigged from discarded water bottles and wire to hang from a curtain rail (best to replace your regular curtain rail with something stronger like doweling). Herbs can grow well in these conditions, but use the sunniest window if you live in a cool area. Our Window Farms has a great guide to setting up a DIY window garden, and a supportive community to keep you informed and engaged. Potatoes can be grown in stacked interlocking crates (like milk crates), adding straw and an extra crate as they grow taller. Finally; what do you grow? Best to find out what is suited to the temperature range and humidity of your local area by asking your local nursery. Herbs and climbers like tomatoes and beans are good for small spaces, and salad greens are quick to grow. Once you’ve decided on the practicalities, the upkeep of your garden will need to include pest control. You can decide whether you’d rather enjoy the influx of insect life and be prepared to sacrifice a little of your crop to them, or you can try some home-made organic pest repellents. If you use commercial pesticides, even the innocuous pyrethrin, you run the risk of killing beneficial as well as unintended insects. A simple bug spray of boiled garlic and chilli will repel most sap-suckers without killing them, while mildew problems can be controlled with baking soda and water spray. Mold can be best controlled by good air circulation and by avoiding over-watering. Worst case, If you really don’t have any space or your landlord isn’t happy about vegetation trailing down the outside of the building you can always join a community garden. Community gardens often give allocated plots to individuals, and you get to share your sowing wisdom with others.